Figure 7.8 A sight that is all too common beside our roads and highways. Photo: M Schulz alter their habits simply because a road has been constructed through their forest. Even long after a road has been established, they will amble across it as though it is just another open space in the forest, although they will use culverts if these happen to lie in their path. To add to the hazard, they are often attracted to roadsides to graze on some of the grasses and clovers planted there to stabilise the ground. 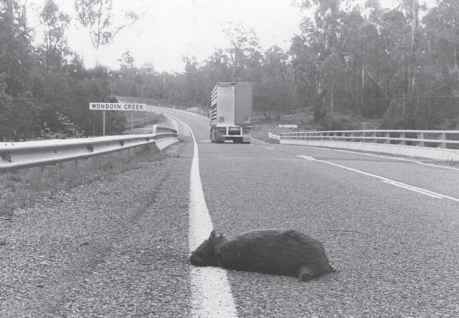 After rain, when there is fresh growth along the roadsides, wombats are killed in even greater numbers than usual. Following bushfires, too, when roadside grass is often the only green food left in a burnt area, the number of animal casualties increases markedly. 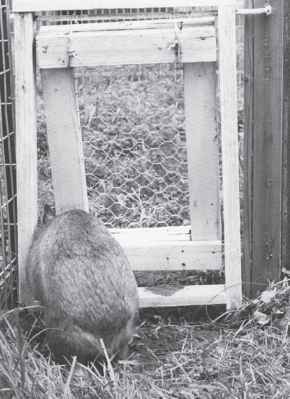 Wombats are easy prey for spotlight shooters at any time, but especially so when they are grazing beside a road.